Guests of Telluride Gay Ski Week 2008 can look forward to over 72 inches at the base and an average depth of 51 inches when they arrive at the slopes this year. With more snow in the forecast, skiers are enjoying packed powder surface conditions at Telluride Ski Resort. Currently 16 out of 17 lifts are in operations and all 92 trails are available to skiers throughout the 1700 acres of open area. "We have had fantastic powder skiing in Telluride this season and look forward to sharing these great conditions," said Michael Wisniewski, president of Telluride Mountain Village Owners Association, a headline sponsor of Gay Ski Week. "In addition to bringing vitality to Mountain Village, funds raised from the event provide tremendous support to the Telluride AIDS Benefit." The annual Telluride Gay Ski Week (TGSW) is a unique vacation experience that stands apart from other gay ski functions. 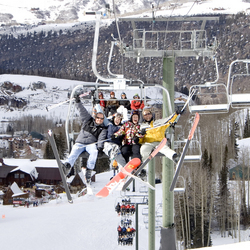 Designed as an alternative to other gay ski events, TGSW combines a unique blend of top-rate skiing and unpretentious activities with spirited but laid-back charm of a European-style ski town. Guests will enjoy the 92-acre pedestrian centre of Mountain Village that encompasses an array of recreational facilities, restaurants, hotels and shops offering a unique selection of jewelry, furnishings, apparel and antiques. Sponsors of Telluride Gay Ski Week 2008 include Barefoot Wine, Amstel, BUMP! TV, Orbitz, TMVOA, StraightOut Media & Marketing, Telluride.com, Telluride Watch, Red Nightlife Magazine, Alpine Lodging, Plum TV, Passport Magazine, OutFront, Jimmy Belasco Candles, Out Word and Mountain Lodge.